For the past few years, Western’s Orlando branch has been teaming up with Tremco Roofing on many central Florida projects. Western’s Orlando Branch Manager, Chester Scott, has been working closely with Justin Ranck, local Tremco Roofing Division Representative as they trade industry knowledge. Chester educates Justin and his team on the means and methods of exterior building facade repairs, while Justin educates Chester and his team about their comprehensive roofing and weatherproofing solutions. This has been a very beneficial relationship for both parties involved; in 2015, the Orlando branch sold over $2.5 million in Tremco projects. Tremco Roofing recently invited Western to their Annual Meeting in Orlando with the goal of introducing Western and their services to 6 additional southern regions. 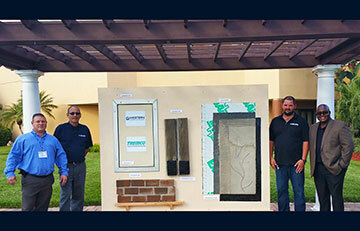 Western created a 6’x8’ mock-up display wall to showcase repair methods for: masonry brick stitching, rout and seal hairline cracks in the brick and brick mortar, horizontal and vertical sealants replacement, mechanical expansion joint systems, concrete repairs, traffic deck coatings, installing vapor barriers, urethane and epoxy injections and below grade waterproofing. Aside from the Annual Meeting, Western has attended many other Tremco events within the past year including the Sales Conference that was held in Cleveland, OH in October, and most recently, President Jeff Kelley and National Accounts of Field Marketing Vice President Mark Sheehan visited Tremco Commercial Sealants and Waterproofing’s Test Facility to learn more about their wide range of industry products. Our goal here at Western is to continue building the relationship with Tremco across all of our 30+ branches. To date, we have partnered with Tremco on projects in Florida, Chicago, New York, Iowa, California, North Carolina and many other locations.